It was another routine propane delivery to Hospital Materno Infantil Cuajimalpa (Cuajimalpa Maternal Hospital) in Mexico City—at first. But, at 7:20 a.m., the gas pipe feeding the hospital’s kitchen ruptured. For at least 15 minutes, three workers from gas supplier Nieto Express sought to contain the leaking fuel. Then something—nobody knows what—sparked the propane-filled air. An earth-rattling boom followed, and a giant plume of smoke rose over the hospital. Over half of Cuajimalpa Maternal collapsed, threatening the 110 people inside, many of whom became trapped beneath the rubble. The official toll would stand at three killed, 66 injured, many of them the victims of flying shards of broken glass. Nearby residents were the first to arrive on the scene to render aid, and initially mistook the blast for an earthquake. Instead, it was Mexico City’s third fatal, large-scale gas explosion in two years. One ripped through the headquarters of petroleum firm Pemex, another wiped out motorists on an open highway. In the wake of the Cuajimalpa disaster, some would call for reconsideration of Mexico City’s heavy reliance on gas-tank and propane deliveries instead of pipelines. That’s no small compliment to the Volunteer Ministers. Los Topos is an elite unit, born out of the September 19, 1985, earthquake that devastated Mexico City. That day, Hector “Chino” Mendez plunged heedlessly into the danger and chaos, searching for his brother (who would be found alive). Joining forces with other bystanders, Mendez dug for hours. He rescued at least four people from perishing in the ruins. It was a life-changing experience that impelled Mendez to form “The Aztec Moles” (Los Topos Aztecas). Now simply Los Topos, they go where trouble calls, whether it’s Ground Zero on 9/11 or a demolished cathedral in the 2010 earthquake in Port-au-Prince, Haiti—where the relationship with the Scientology Volunteer Ministers began. During the Haitian disaster, Los Topos became acquainted with the yellow-shirted Volunteer Ministers and a mutual admiration developed. 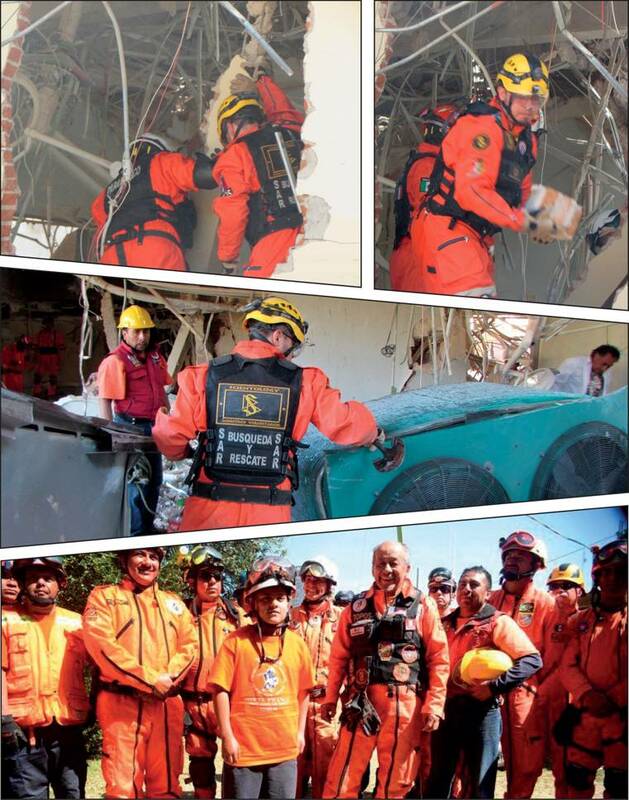 When Hurricane Manuel struck Acapulco in 2013, nearly 100 Los Topos and Volunteer Ministers joined forces to perform search-and-rescue operations. The two groups also collaborated on disaster relief in Japan, Guatemala, Turkey and the Pemex explosion in Mexico City. 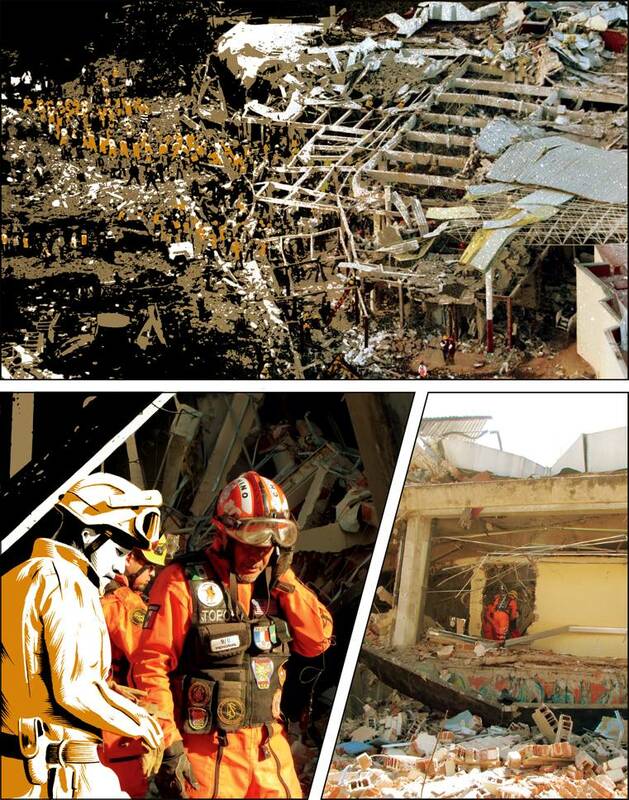 At Cuajimalpa Maternal, the Volunteer Ministers supplemented their yellow shirts with yellow helmets and descended into what remained of the hospital. Their first priority was securing a potentially dangerous piece of medical equipment. “An officer from the federal Mexican police informed us that there might be an X-ray machine on the site that contained cobalt-60, a radioactive and highly poisonous substance,” Dellano recalls. Three hours into the painstaking search, Mexico City emergency officials were able to confirm that there was not a cobalt-60 machine on the site “which was of course a relief,” remembers Dellano. “What we did find was almost total destruction of the hospital,” he continues. “The site became increasingly dangerous as the search and rescue work carried on. There was the risk of total structural collapse, and at one point gas began leaking again,” which caused a secondary fire that took firefighters two hours to contain. They worked at it all that first day, then long into the night. Temperatures fell to freezing, and they were lightly dressed. Now it was the Topos/Volunteer Minister force that would receive some support—from nearby residents who materialized with food and coffee. 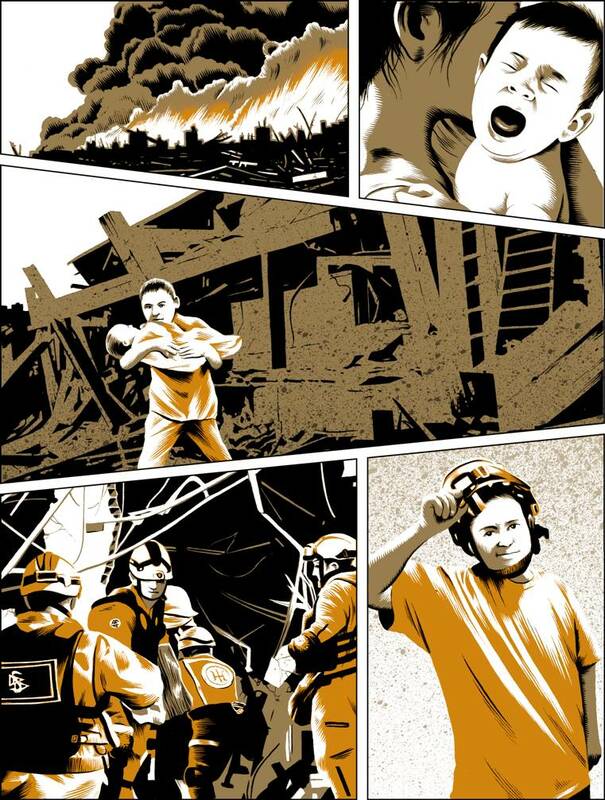 Leading the coffee-distribution effort was an 11-year-old boy named Jonathan Tobon Ruiz. Jonathan, a stocky youth with a thick shock of black hair, lives just down the street from the hospital site, “in a very humble home,” says Dellano. Back at Cuajimalpa Maternal, the sun came up on the day after the disaster. By late morning on that second day, all the people reported missing in the accident had been accounted for and the rescue force began to thin out, ultimately dwindling to 20 or so Los Topos and Volunteer Minister workers and a few stragglers from other rescue teams. Scientology Volunteer Ministers stayed at the site with the clearing crews for two more grueling days. In rare downtime—resting at night or breaking for meals—they took time to counsel the workers, helping them cope with the emotional difficulty of combing through a scene of mass destruction. They also counseled nearby residents traumatized by the explosion and the subsequent chaos. It was well worth it. “During these three days, people living in the area, people from other rescue teams on site the first day—even policemen—approached us and thanked us for risking our lives to help people we didn’t even know,” Dellano says. Where disaster strikes, it’s a fair bet that Los Topos and the Volunteer Ministers (who number 1,000 in Latin America) will be there—and perhaps one day little Jonathan Tobon Ruiz will be among their ranks. That was the message James “Rocky” Robinson, commanding officer of the Bedford-Stuyvesant Volunteer Ambulance Corps in New York City, received in January 2010 from the Scientology Volunteer Ministers. Robinson was trying to get a rescue crew to Haiti in the days after the devastating earthquake, but his efforts had run into a wall of red tape. “They carry hope, they carry peace and they carry love,” says Robinson of the Volunteer Ministers force. More practically, the Volunteer Ministers chartered four flights and a former Coast Guard vessel for Robinson’s Bed-Stuy ambulance corps and other relief workers. Once on the ground, the Volunteer Ministers helped distribute water, stock medical supplies, unload cargo and provide shelter for victims of the quake. This was no short-term commitment: The “yellow bolt of hope,” as they became known, eventually established a permanent presence in Petionville, Haiti, where their work continues to this day. For these efforts, the Volunteer Ministers were recognized by the Haitian American Nurses Organization with a humanitarian award. Established in 1976, the Volunteer Ministers have a presence in 120 countries and a global network of affiliates. The September 11 attacks and 2005 Hurricane Katrina (which saw 900+ Volunteer Ministers mobilized) are only the highest-profile of the group’s many and ecumenical relief efforts. Volunteer Ministers also conduct outreach to establish a yellow-shirt presence in isolated areas where aid missions don’t yet exist. “Extreme pioneer tours” carry help to areas as isolated as the far northern reaches of Australia, Burkina Faso and the deepest rainforest regions along the Amazon (aboard the Church’s very own river boat). Rather than wait for trouble, the Volunteer Ministers are a proactive force, one that’s styling yellow as the color of hope.